Given that 2016 broke a number of unenviable global warming records, it seemed advisable that the Paris Agreement to combat climate change, adopted by 195 countries in the French capital in December 2015, should come into force and be implemented in good time. The first, easier part was achieved surprisingly quickly – enough parliaments had ratified it even before delegates gathered in November in Marrakesh for Paris’s follow-up meeting, COP22. But as for implementation, the devil is in the detail, and much will depend on whether countries live up to the nationally determined contributions that underpin the Paris accord. Plans are now in place for countries to sign off on a new rulebook that envisages them taking responsibility for their own progress from 2020. 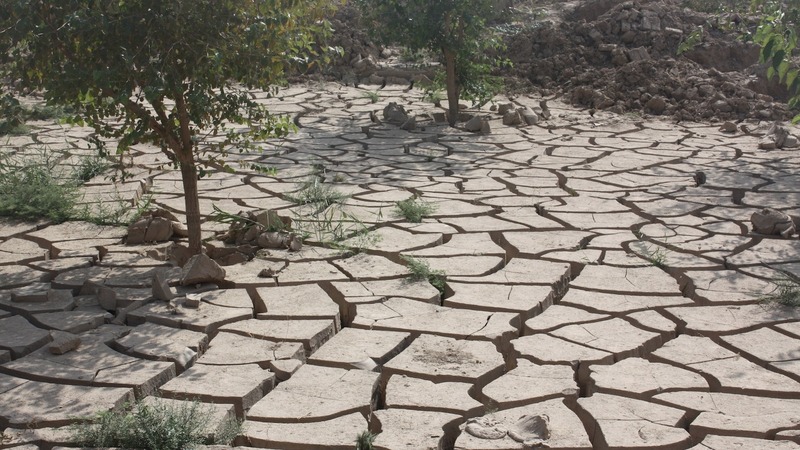 Parched earth following a drought in northern Afghanistan. The region has been hit by increasingly unpredictable weather, with most experts agreeing it is an effect of climate change. Caveats: There is the small matter of a climate change denier, namely Donald J. Trump, being elected president of the country that has been the driving force behind the Paris agreement. And, even if President Trump can’t (and/or doesn’t choose to) torpedo one of the last remaining planks of his predecessor’s legacy, the accord could still be too little too late. Analysis shows that even if national targets are fully implemented, the world will be 2.7 degrees warmer by the end of the century – a temperature rise that would have disastrous consequences. In a year of bad and worse news, the fact that so-called Islamic State is being forced off the land it controls is a chink of light for those civilians who have known the horror of its rule. The group has been kicked out of key holdings in Iraq – Ramadi and Fallujah – and lost al-Shaddadi in Syria’s Hassakah province, and Manbij near the Turkish border. Libyan forces backed by US airstrikes recently finished off the group in Sirte. It now holds no territory in the country, although members are still active. And the Iraqi army and its allies are now making slow progress towards Mosul, its last stronghold in Iraq – victory there would leave Raqqa in Syria as its major territorial holding, although it is resurgent in and around Palmyra. Caveats: We’re loath to call any military campaign ‘good’ – the Iraqi military’s assault against IS in Fallujah involved a punishing siege, and there have been many reported cases of retribution (often by allied militias) against civilians after liberation. And then there are the civilian casualties of course – those IS has been said to use as human shields or execute for attempting to flee, and those killed in coalition airstrikes, not to mention the innocent victims of the more relentless bombing campaigns ordered by the Russian and Syrian governments. There’s also growing concern that as IS-controlled territory shrinks, the group will increasingly turn its attention to sowing chaos in the sort of attacks regularly seen in Baghdad, and recently at a Christmas market in Berlin. That said, it’s hard to forget the jubilation of those liberated from IS rule – women smoking cigarettes, men cutting the beards they had forced upon them, and church bells ringing. In November, Colombia’s Congress approved a peace deal with the FARC rebel group, bringing an end to more than half a century of fighting and – proponents hope – allowing the country to begin a process of healing. The deal will see FARC disarmed and demobilised, and its assets used for victim compensation. The group will form a political party, and have a guaranteed 10 seats in Congress. If the agreement, seen as tougher on FARC than the original version Colombians rejected in a plebiscite two months earlier, ends the bloodshed in Colombia, it’ll be a massive win for the country. More than 260,000 people have died in the conflict, mostly civilians, and nearly seven million people have been displaced. Caveats: While supporters waved flags as the deal was signed — and President Juan Manuel Santos won the Nobel Peace Prize before the “no” vote — not everyone is celebrating. Opposition leader and former president Alvaro Uribe argues Colombia is still letting the rebels get off easy. He walked out of Congress before the vote. Behind the politics, there are real concerns about justice: fighters who have confessed to war crimes will not serve time in prison. And with FARC promising to break its links with the drug trade, the country’s coca growers, who insist they are doing what they must to get by, are afraid their livelihoods are threatened. Plus, history in Colombia has shown that reintegration will be anything but easy. In September 2015, the image of Aylan Kurdi, a dead Syrian toddler lying face down on a Turkish beach, galvanised the Canadian public. Canada has had a private sponsorship programme since 1979, allowing groups of individual Canadians to finance the resettlement of specific refugees. Besides making a financial commitment, sponsors provide practical and emotional support as the refugees settle into their new homes. In late 2015 and early 2016, the programme was scaled up to meet Prime Minister Justin Trudeau’s election promise to fast-track the resettlement of 25,000 Syrians to Canada by the end of February 2016. While Europe has shored up its borders and Trump has promised to reduce refugee resettlement to the United States, the Canadian government has struggled to find and screen sufficient numbers of eligible refugees to meet the demand of willing sponsors. Canada’s model of private sponsorship helped inspire a Global Refugee Sponsorship Initiative that launched in Ottawa in December. Several other countries, including the United Kingdom, Germany, Italy, and New Zealand are now implementing their own private refugee sponsorship programmes and interest in this approach continues to grow. Caveat: Funding for the refugees, whether privately- or government-sponsored, is only in place for one year, while many need longer to integrate and become self-sufficient. A Senate committee has called on Trudeau’s government to allocate more resources as a matter of priority. This came very late in the year, at the start of the holiday season, and was overshadowed by lots of headlines about celebrities dying, so you might have missed it. On 22 December, The Lancet medical journal published findings from the trial of an experimental Ebola vaccine involving 11,000 people in Guinea. Not a single person vaccinated contracted the Ebola virus and the vaccine was found to be well tolerated and to produce a rapid immune response after just a single dose. The study also highlighted the importance of discovering that trials such as this one, called “Ebola ça Suffit" (French for “Ebola that’s enough”), could be conducted in the challenging aftermath of epidemics and still be effective. The Ebola outbreak in West Africa claimed more than 11,300 lives, mainly in Liberia, Sierra Leone, and Guinea, between 2013 and 2016. “While these compelling results come too late for those who lost their lives during West Africa’s Ebola epidemic, they show that when the next Ebola outbreak hits, we will not be defenceless,” Marie-Paule Kieny, assistant director-general for health systems and innovation at the World Health Organization, and the study’s lead author, said in a statement. Caveats: Not required (Good news, no strings attached).